Eddie Dunbar has been showing what he’s made of, hitting the front and splitting a quality field to pieces in Italy. 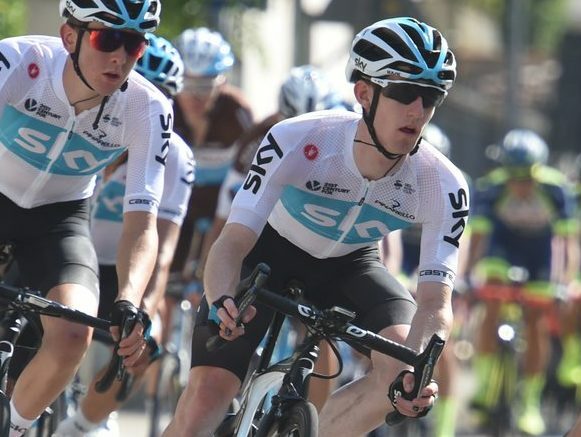 Team Sky and its leader in Italy at present, Gianni Moscon, have described as “spectacular” Eddie Dunbar’s ride at Giro della Toscana. Moscon would break clear with Romain Bardet (Ag2r-La Mondiale) and Domenico Pozzovivo (Bahrain Merida) on the final and third ascent of the Monte Serra climb yesterday. That trio pushed on and while Pozzovivo was dropped by the other two on the 28km breakaway to the finish, he got back to them. The Italian attacked Moscon and Bardet late in the race but was closed down. Moscon and Bardet then sprinted it out, with the Italian getting the verdict. Pozzovivo was 3rd a few seconds later. However, while Moscon was the winner for Team Sky, it was Eddie Dunbar who really covered himself in glory. He finished in an 18-man chase group some 1:22 down, taking 15th place. But that result doesn’t tell the story of his race. Dunbar had hit the third passage of the 8km climb hard, completely splitting the field. In fact, he did so much damage in a 2km uphill section on the front that only the eventual top three could match him. Moscon won, but it was Eddie Dunbar who really impressed. Not even a week into his Team Sky tenure he has made a huge impression. He looks in great form before the Worlds, where he will ride the U23 road race. After Dunbar had pulled the trio clear, Bardet attacked with just under 2km to go to the top of the climb. That acceleration jettisoned Dunbar from the front group, though only after he had done an amazing job. And even when he went back to the chase group that would form behind the breakaway, he continued to play his role in ensuring nobody got back to the leading three. He disrupted the chase by sitting close to the front of the chase group; frustrating the cooperation of the others. And he also covered several counter attacks that set off in pursuit of the leaders. Moscon was delighted with his second win in a matter of days. And he singled out Eddie Dunbar for fulsome praise. “I’m going through a great period of form. The team today did great work,” Moscon said of the 199km race in Pontedera, Italy. “The young guys have surprised me as they are super strong,” he said of Dunbar and 19-year-old stagiaires Ethan Hayter and Mark Donovan. “Everyone is doing their job, going deep and there is a big commitment from everyone. 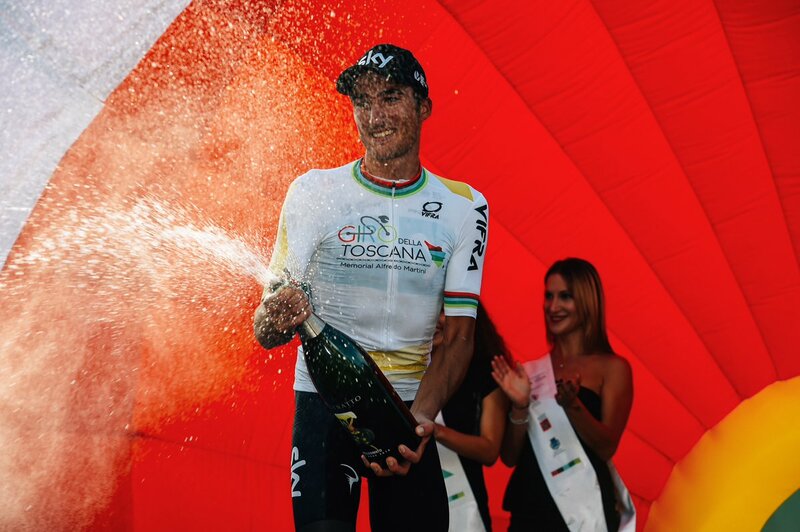 Moscon, who is coming back from a suspension after hitting out at a rival in the Tour de France, also won the hilly 200km Coppa Agostoni in Italy last Saturday; again after some really impressive work on the climbs by Dunbar. And the 24-year-old Italian will go into the World Road Championships on Sunday week as one of the favourites. “These wins are really good for the morale and they give me confidence,” Moscon said of getting his form back.